After searching the site with sniffer dogs, police determined late on Thursday that no one would be pulled out alive. 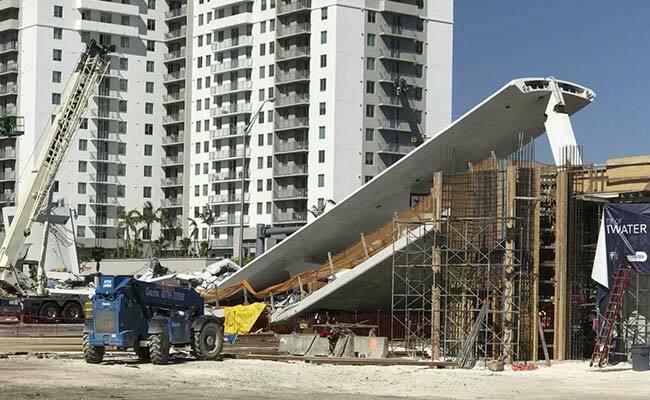 Miami: Workers slowly broke up chunks of a newly built footbridge that collapsed onto a major road in Miami, killing at least six people, and police on Friday warned that more victims could be found in crushed vehicles in the rubble. The 950-ton bridge plummeted onto traffic on one of the busiest roads in South Florida on Thursday. With at least eight vehicles still buried on Friday morning, the death toll could rise, said Juan Perez, the Miami-Dade Police Department director. "We know that there's people missing, the family members know that there's people missing, and what we can tell them is that we can assume that they're in there," Perez said at a news conference. After searching the site with sniffer dogs, police determined late on Thursday that no one would be pulled out alive, Perez told reporters on Friday. The victims have not been publicly identified, but at least one was a student at Florida International University (FIU), whose campus borders the roadway, officials told the news conference. The student was female, university President Mark Rosenberg told Miami's 7News. At least 10 people were taken to hospitals; two were in critical condition, officials and local news media reported. Witnesses told local media the vehicles had stopped at a traffic light when the bridge collapsed on top of them around 1:30 p.m. ET (1730 GMT). News reports saying engineers may have been conducting a stress test on the bridge that may have led to its collapse could not be confirmed, Perez and other Miami officials told reporters. It was too early to say whether criminal charges might be brought against anyone, Perez said. The 174-feet-long (53-meter-long) bridge connected the university with the city of Sweetwater and was installed on Saturday in six hours over the eight-lane highway, according to a report posted on the university's website. "If anybody has done anything wrong, we will hold them accountable," Florida Governor Rick Scott said late on Thursday. His office earlier issued a statement saying a company contracted to inspect the bridge was not pre-qualified by the state. National Transportation Safety Board officials were on the scene on Friday to investigate why it collapsed. The bridge was intended to provide a walkway over the busy street, where an 18-year-old female FIU student from San Diego was killed in August as she attempted to cross, according to local media reports. Students at FIU were on their spring break vacation, which runs from March 12 to March 17. To limit disruption to traffic during construction, the 174-foot portion of the bridge was built adjacent to Southwest 8th Street, using a method called Accelerated Bridge Construction. It was driven into its perpendicular position across the road by a rig in only six hours on Saturday, according to a statement released by the university. The $14.2 million bridge was designed to withstand a Category 5 hurricane, the rating given the most dangerous storms by the National Hurricane Center, and built to last 100 years, the university said.